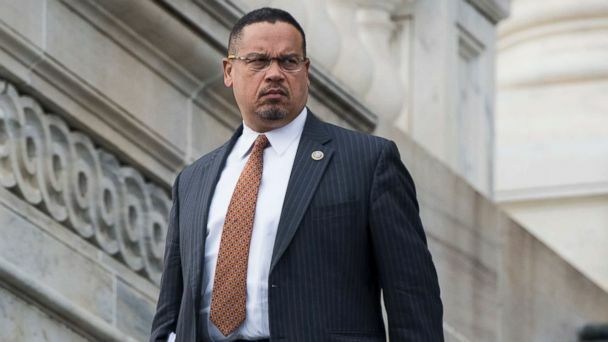 Rep. Keith Ellison is denying allegations of abuse against a former girlfriend, made by the woman's son, just days before he runs in his state's primary for attorney general. Austin Monahan, the son of Ellison's former girlfriend Karen Monahan, shared a lengthy post on his Facebook page detailing physical abuse by the congressman during the relationship. Monahan said he saw hundreds of text messages and tweets by Ellison toward his mother that included victim shaming, bullying and threats if she publicly discussed the abuse. He also said he found a video on his mother's computer of Ellison dragging Karen Monahan off a bed and screaming profanity at her. Ellison, a Democrat from Minnesota, unequivocally denied the abuse and said the video does not exist in a statement Sunday. "Karen and I were in a long-term relationship which ended in 2016, and I still care deeply for her well-being," Ellison said in the statement. "This video does not exist because I never behaved in this way, and any characterization otherwise is false." Karen Monahan later confirmed the information in her son's post on Twitter, according to The Associated Press. "Sitting all this time, watching what our mom went through and not being able to say or do anything was hard as hell," Austin Monahan, 25, wrote. "None of you know the hell our family has gone through. I don't think half of you would even care. We watched her so called political friends stand by say or do nothing. People had an idea what happened and never reached out to my mom." Ellison announced in June he was not running for re-election to Congress in order to run for Minnesota attorney general. The Democratic primary for attorney general, in which he faces four opponents, is Tuesday, Aug. 14. The 55-year-old has represented the 5th Congressional District since 2007, and also serves as deputy chair of the Democratic National Committee. "I use (sic) to believe the Democrats were the ones who would stand by a person who went through this kind of abuse, now I know both Democrats and Republicans could care less when it comes to violence toward women and girls," Austin wrote.